PHARRELL WILLIAMS TENNIS HU SHOES. The Tennis Hu shoes reimagine crisp court style with creative flair. The stretchy knit upper hugs the foot for a supportive and comfortable feel. An adidas Originals collaboration Designed with the multitalented musician, producer and artist Pharrell Williams Colorful details The outsole features color-pop rubber inserts. Color(s): Gray/ Purple. Opportunity Village's MISSION. Excellent condition pre owned. Extra laces. Rare color!! Adidas Women's Shoes Cloudfoam Advantage Clean Sneakers Pink 7 M. Condition is Pre-owned. Shipped with USPS Priority Mail. Adidas Edge Lux Black/Red Tennis Shoe Womens 9.5 Used. Slight wear but basically like new. Shipped with USPS Priority Mail. Adidas Neo Dusty Blue Tennis Shoes Womens Size 9.5 Used. I have only worn these about 3 times. Any smudges or dirt you see on them should easily come off with a rag and some cleaner. I was just too lazy to do it before posting. Shipped with USPS Priority Mail. ADIDAS NMD R1 W PK PRIMEKNIT SEA CRYSTAL SPORT YOGA SNEAKERS TENNIS SHOE 81/2 US. Condition is New with defects. Shipped with FedEx Priority Mail. One shoe lace has a defective end to it please look at the pictures. Like New: Open-Box Return, Great Brands, Great Value! Women's Adidas Courtset Sneaker - Navy/White, Size 7 (Model AW4212). Condition is New with box. Shipped with USPS Priority Mail. Up for AUCTION.. NEW womens Adidas Ortholite FLOAT Cloudfoam canvas shoe, size 7.5, never worn without box.White with rose gold. ANY Questions feel free to ask! Sz women’s 9 . Pre owned good condition Purple and white Adidas shell toes. About 15 years old only worn a handful of times. Missy Elliot line. Pay pal payment only please. Shipping flat rate USPS to the lower 48 United States only. No returns or exchanges. Final sale. Please feel free to ask any questions prior to bidding. Spring cleaning so please look at my other auctions! Authentic Rare Adidas Y-3 Roland Garros Floral Print Tennis Sneakers Size US 6.5. Condition is Pre-owned. Shipped with USPS Priority Mail. Very nice pre-owned condition women's sneakers size 6.5 US. Has black top half of round black symbol missing on back of left sneaker. View last photo for mainly only major imperfection. These have been worn a hand full of times only. Lots of life left. Love the colorful Hawaiian Pattern for Spring time!! I'm researching these sneakers and I found that these are from May 2015 collection. Also, the internet shows this sneaker under men's but I think it looks very pretty!. Again, inside of sneaker reads 6.5 US Thanks for looking! US buyers only and no returns please! adidas Stan Smith white green Women’s 9.5 Tennis Sneakers Classics Worn Once! 100% authentic adidas Stan Smith in classic white and green. These were worn once for about 4 hours. Clean with absolutely no flaws. Will ship immediately via Priority Mail. Thank you! 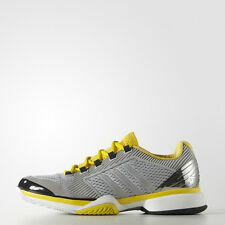 It rocks a sweet athletic vibe with a supple leather upper and an authentic 3-Stripes design. 3-Stripes design. Lace-up front. Trending at $38.99eBay determines this price through a machine learned model of the product's sale prices within the last 90 days. Only worn 3 times on clay courts! 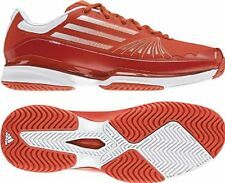 From a non smoking home adidas women Adizero Tennis Shoes 10 Hot Pink. Condition is Pre-owned. Shipped with USPS Priority Mail. LEATHER UPPER WITH BLACK ADIDAS STRIPES FOR DURABILITY AND STYLE. HEEL COUNTER FOR ADDED STABILITY. WHITE / BLACK. NEW WITHOUT BOX. PADDED COLLAR AND TONGUE FOR ADDED COMFORT. 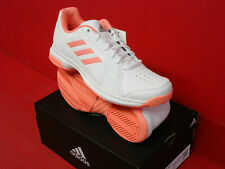 adidas Vs Pace Sneakers- White- Womens Size 6. Condition is New with box. Shipped with USPS Priority Mail. Pink, Purple & Gray Adidas Sneakers Womens Tennis Shoes Size: 10. Condition is Pre-owned. If payment isn’t received within 48 hours an automatic unpaid case will be open. Women's Adidas Sambarose Platform Shoes Size 6 Pink Brand New In Box! Women's Adidas Sambarose Platform Shoes Size 6 Pink Brand New In Box with tags! Awesome shoes! See pictures. Good Luck! Adidas Stan Smith Worn Once Size 8 Women. Condition is Pre-owned. Shipped with USPS Priority Mail. Only wore these once-like new condition. White with magenta detail. I bought these in the children’s section so tag says size 6 but they fit women’s size 8. 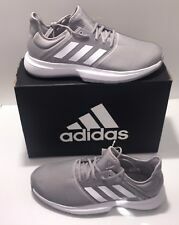 ADIDAS NEON Ladies Tennis Shoes Gray Size US 9.5 ( #1369 ) New !!! !